We are a leading Manufacturer of column pipe adapter and long adapter from Rajkot, India. 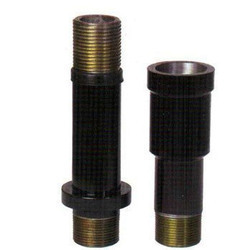 Sturdily constructed our range of Column Pipe Adapter has become the preferred choice of the customers. Made from using quality components, these products have corrosion resistance and can perform well in long run. We do not compromises in terms of quality of our range and make sure that our clientele is served in most desirable manner. These products can also be custom-made as per the details and specifications laid down by the clients. Looking for Column Pipe Adapter ?